Bring a cutting-edge, fully immersive arcade experience right to your doorstep with the Game Trailer Rental from Jump Around Party Rentals! 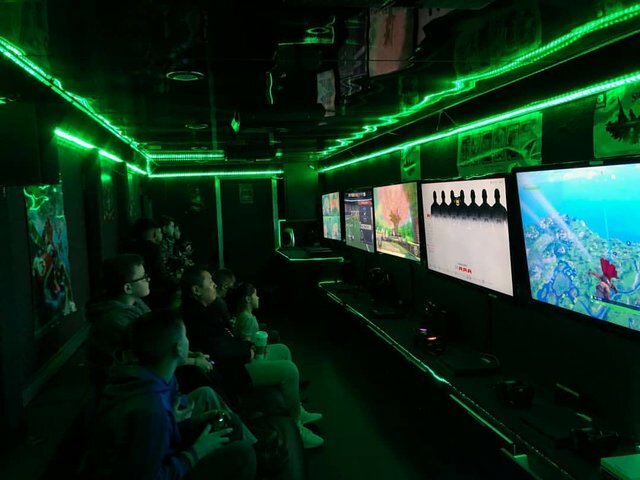 This awesome trailer is fully equipped with surround-sound audio, multiple screens, and all the current-generation consoles so that your guests can dive into their favorite games (and yes, this includes Fortnite!). Set up for multiplayer action, the Game Trailer Rental is 12’ in width and 26’ in length and can seat a total of 16 players at once! The Game Trailer Rental is truly a gamer’s dream realized, and only Jump Around Party Rentals can provide your next party or celebration with this unique and innovative party attraction! Book the Game Trailer Rental here with just a few easy clicks! For more information on this or any other of our exciting party rentals and attractions, we invite you to contact us directly at 512-317-2221!